This project is a bio pharmaceutical company which develop a clinical gal for the treatment of diabetic chronic wounds, which is safe, effective and affordable. This gal can significantly reduce the duration of hospitalization and reduce the number of limb amputations. Most importantly, it can reduce mortality rate. It cal also used to heal pressure wounds, burns and surgical wounds. By 2017, there are 425 million people with diabetes worldwide, and China's diabetes patients account for 26% of the world's total amount, reaching 114 million. One of the most common complications of diabetes is the difficulty in wound healing. According to statistics, 15% of diabetic patients have difficulty in wounds healing. And their wounds are very susceptible to infection, which may cause amputation. And 1% of diabetics eventually had to amputate. In addition, diabetic foot ulcer is another major cause of amputation in diabetic patients. To-day there is no single drug for chronic wounds, in particular diabetic foot ulcers. The existing commercialized products do not facilitate the healing process, their functions are only to provide an optimum healing environment. Besides, they are expensive. 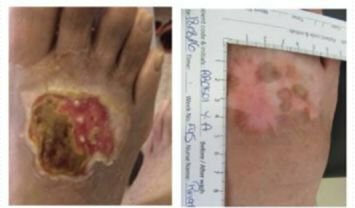 The absence of safe and cost-effective treatments for diabetic foot ulcers leads to amputations, disabilities, high mortality, and high expenses for health systems. By creating a new concept for wound treatment through the use of innovative and unique products, this project has developed a technology of innovative topical formulations that contain erythropoietin (EPO), a known and approved drug for anemia. Repurposing of EPO assures fast and effective regulatory pathway for its products. Its lead product, wound healing product is currently being evaluated in clinical trials in diabetic patients with foot ulcers. It is safe, effective, and affordable and can be also indicated for pressure ulcers, burns, and chronic wounds of severe skin conditions. Its patented technology is a game changer in the wound care market and its product will become soon the only drug in this huge market. This project’s intellectual properities include drug-based solutions for bone healing, such as the stimulation and acceleration of healing of non-union bone fractures and dental implants. Worldwide, chronic wounds affect more than 40 million patients with an estimated annual cost of approximately US$30 billion, making up 3-4% of total health care expenses. In developed countries, it has been estimated that 1-2% of the population will experience a chronic wound at least once during their lifetime. Patients with burn wound present an additional huge market opportunity, with an estimated global market size at US$3 billion in 2017. This project has incorporated the concepts of regulatory approval from narrow to wider indications. It has established a well-defined regulatory development plan for the approval of its lead product for wound healing product. The company focuses on the finalization of phase II clinical trials of wound healing product to either partner with big pharmaceuticals through a milestone M&A deal or go public for the commercialization. Out-licensing of wound healing product to big pharmaceuticals or regionally is another potential option. Seeks for 5 – 10 million USD (current round). Use of proceeds: phase II clinical trials, regulatory affairs, marketing approval, and business development activities.